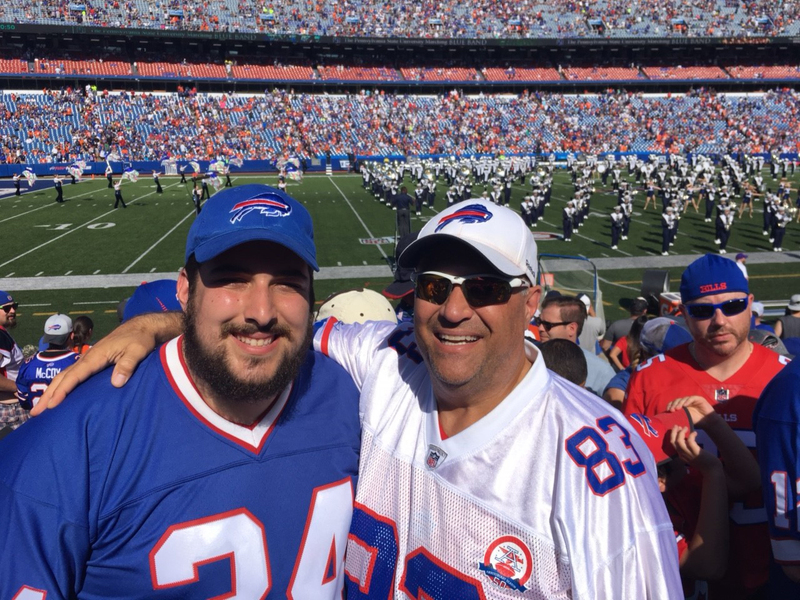 Football certainly means family for Martin Bazinet, who has been a Bills Season Ticket Member since 2006 when he moved to the Toronto area from Montreal. Bazinet’s love for the Bills, however, dates back much farther. Watching the CFL’s Montreal Alouettes with his father in the 1970s, Bazinet became a big Marv Levy fan. Levy, head coach of the Alouettes at the time, led the team to two championships and was named the Coach of the Year in 1974. When Levy embarked on the next chapter of his coaching career with Buffalo in 1986, Bazinet quickly developed a passion for the Bills. Under Levy’s tutelage, the Bills won four consecutive AFC Championships in the 90s, solidifying Bazinet’s fandom forever. Bazinet has been making memories on Sundays at New Era Field ever since. Some of his fondest include attending his first-ever Bills game with his son Charles in 2006, last season’s snow game against the Indianapolis Colts and watching the team advance to the playoffs for the first time since 1999. The Week 15 snow game featured blizzard-like conditions, which made it tough to see the field. Despite the cold and snow, Bazinet explained that it was all worth it in the end. “Just being able to say that we were there from kickoff to the end of the game [is great],” said Bazinet. For the duo, game days at New Era Field start several hours prior to the first snap. Driving from Canada for each home game requires them to wake up early, which not only affords them enough time to cross the border, it gives them an opportunity to set up their one-of-a-kind tailgate. Over the years, Bazinet has come to enjoy the many benefits associated with his membership. Not only does he get to watch firsthand as his favorite current Bills players LeSean McCoy and Kyle Williams take the field, he truly feels that he is a part of the team. Bazinet also appreciates the user-friendly online resources available to help him with the seat relocation process. Something that he has done now three times throughout the course of his tenure, Bazinet finds it extremely convenient to be able to select available seats on his own. The Buffalo Bills would like to thank Martin for his many years of being a loyal Bills Season Ticket Member and our Season Ticket Member of the Month for the month of May. In addition to Martin being selected as a Season Ticket Member of the Month, he will receive a club seat upgrade, an autographed item and select Bills merchandise. If you would like to nominate a Season Ticket Member of the Month, please fill out the form located here.